Bring Those Deep Set Eyes Out To Play! How Do You Apply Makeup To Deep Set Eyes? So what is the best way to apply makeup that complements deep set eyes? I’ll be showing you how to recognize whether your eyes are deep set or not. You do this with the type of eye shadow colors you choose, and the patterns you apply them in! So- Are Your Eyes Really Deep Set? When eyes are deep-set are located deeper in the eye socket than others. That's why, a lot of the time, you'll find them looking sunken. The biggest sign of this is a dark shadow at the crease/ brow bone. The type of shadow that most people with other eye shapes would create with a crease brush. Here is where we clear up a small confusion. A person with deep set eyes does not necessarily have hooded eyes… Deep set and hooded eyes are based two different characteristics. The former is based on the shape created by the relationship between your eyes and eye sockets. The latter is based on the relationship between the skin above the brow bone and the eyelid. Celebrities with this eye shape include Iman and Jennifer Love Hewitt. If you look at most actors, you will notice that an overwhelming majority have this type of eye. Some have smaller eyes that are that obviously deep set because of their size. Look at pictures of Kate Winslet, Halle Berry, Kiera Knightly, or any good actor/ actress and you’re likely to see those deep, deep set eyes. Face reading theories say that deep set eyes indicate observant tendencies. So these are people who are apparently mostly like to step back, assess, and study situations...and become really rich from their talent! It becomes simple to apply makeup when there’s so many references you can use. Now let’s go through the basic details you should keep in mind when doing your makeup for day or night! There is a big difference in the type of makeup you can successfully apply depending on whether your eyes are big or small. If you have big eyes, your crease is more noticeable and dramatic. Then your eyes probably look best in a uniform and light colour palate. Smaller eyes are much easier to work with because the crease is not as obvious. They could even be said not to belong to the deep set category because the rules for deep set eyes don’t actually apply. When buying eye shadow, try and go for more intense shades of light colors, rather than for actual dark colors themselves. When I say ‘dark’ colours, this refers to those that are darker than your crease. For example, what would be a dark color for a very light skinned white woman in the UK would be considered great for a chocolate black woman in Africa. Your eyebrow shape goes a long way to creating your look. You know that eyebrows are the main form of facial expression. If you doubt it, go ahead… try and have a good conversation with a highly ‘botoxed’ person! You’d think that a more space under the brows would balance the recess, but it actually deepens the eye even more. This can make give you that permanently surprised look. Creating a sharp arch that follows the crease could also seem artistic, but it actually makes you look sad. It gives prominence to the downward slope of the crease. Here’s a graphic for you to make a comparison between the effect of different eyebrow shapes. The middle picture shows a balanced, lower eyebrow with a straighter arch. This gives a more relaxed, natural look. When you’re clear about the shape, you can use your chosen hair eyebrow shaping method to create the look. There are a few points to keep in mind when applying eye shadow. This is especially for a toned down, everyday look. It may be best to keep the colours neutral, or a slight smokey eye. Place it under the eye and on the eyelid up to the crease. Start by sweeping a uniform color across your eyelid. Reflective, slightly shimmery colours are also quite brilliant on deep set eyes. The eye shape already has a shadow. Keep black and dark grey shades away from your crease. The three shade method of a light base medium lids, and dark outer lids and crease has to be tweaked a little bit. This is because nature has already filled your crease shadow in for you! You can also decide to skip the eyeshadow and go straight for eyeliner. Apply the eyeliner without being too careful to make it straight in a thicker than usual line. Then go on to smudge it slightly with your finger. Remember to use the finger between your middle finger and your pinkie when applying anything on your eyes. It’s the weakest finger on your hand. Follow up with a second, careful line as close to the lash line as possible. Line your waterline for an even better defined eye line. To pile on the drama, go for a kohl, liquid, or gel eyeliner. Another thing-by emphasis of the dark shadow beyond the crease, I'm really talking to those who haven't had much practice. If you can really blend the eye shadow it can look good if it's cohesive with the crease. That dark color must look like it's steaming out of the crease to look good... So if you'd like to be more creative, go ahead and blend the colour beyond the crease. Have fun with it! An evening look calls for more intense shades of your favorites. Try the neon versions and more shimmery ones. Eyeshadow effects are generally more difficult to see at night. This is true especially in dimmer light. So you want to glam it up and give it a bit more punch! 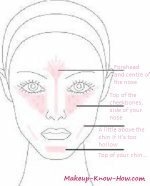 As with regular makeup, there are many ways to apply makeup. The illustration below will show the effect of different applications. Start by applying a base shade as close in color as possible to your skin. Preferably a shimmery gold or an awesome shiny beige color. Follow with your chosen medium color over the entire eyelid, ensuring not to apply it beyond the crease. Then apply the darkest shade (not black) just under the crease and along your upper eyelid. For a smokey eye, you can apply the dark color all over you lid, and this is the best way to use very dark colors, including black, on deep set eyes. Follow this with eyeliner on the top and bottom lashes. Finish off with Mascara on the top lashes. Long, thick lashes always increase the allure in eyes, and if you like, false lashes are also a good option. If you have under eye circles (especially when you have big eyes) avoid lower lash mascara as this might make the shadows more prominent. Rather apply concealer to area to brighten it up. The best thing about deep set eyes is that wise, understanding and inquisitive way they look at everything! So the key to good eye makeup for you is to increase the drama, and deepen that impact without deepening the crease!